I just got my first Apple iPod. Yes, me with an iPod. Don’t ask. It’s the latest Nano, the 5th generation, available since late 2009. It’s tiny, yet it packs 8GB of flash memory, a camera (for video only, not photo…), a microphone, an accelerometer, a relatively big screen, a radio… even a speaker. 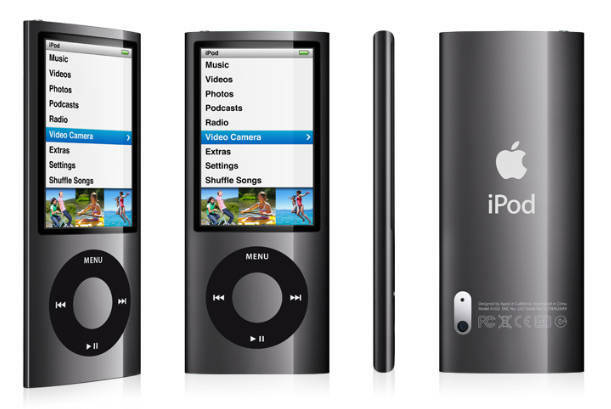 Temporarily get hold of a Windows or MacOS X installation with iTunes, plug in your iPod in order to have it initialized. In theory this can be avoided by generating a hash file based on the device’s serial number and copying it into the right location, but I was unable to get that to work. Copy at least one music file from iTunes to the iPod. I copied one mp3 file just to make sure it was available once the device was ejected. I’m not 100% sure this is a required step, but it might be in order to get the database on the iPod properly initialized. Update libgpod to the latest unstable version (0.7.93 as of writing this, see link below). Fedora 12 already contains the latest gtkpod, a recent Rhythmbox, and an ABI compatible libgpod, so updating only libgpod and python-gpod is enough. Restart Rhythmbox, gtkpod or whatever other iPod compatible music application which uses libgpod you’ve decided to use, select your model when it starts (you might notice that the Nano fifth generation didn’t show up with the original Fedora 12 libgpod but now does with the updated version). You should now be able to see the music you initially added using iTunes. From here, just copy or drag’n’drop all of your music to the iPod! As of Fedora 12, Rhythmbox is really neat, as it copies the album covers, and also automatically transcodes music files unsupported by the iPod on the fly. This means that I can keep all of my ogg/vorbis music collection intact, with the only trade-off being a longer time to copy to the iPod. Once Fedora 13 comes out, all this will no longer be necessary. Thank you. I found this very helpful under Ubuntu Lucid. Rebuilding the latest libgpod and gtkpod from git is not enough; you have to use iTunes once. I agree that copying one mp3 from iTunes is required.